This is a short review of the Kookaburra Blade edge Kashmir willow cricket bat. This is probably one of the most well known entry level kashmir willow cricket bats and we sell a lot of them on www.cricketstoreonline.com. This bat is probably the top selling cricket bat in america at the moment as people are looking for a good quality cricket bat at an affordable price. Watch this short video to see what i have to say about the kookaburra blade edge cricket bat and get a closer look at it. As you can see from the video, the kookaburra blade edge cricket bat is kashmir willow, has a toe guard and has a high spine profile giving you a larger sweet spot.Now before we go any further, let me tell you this. This is a popular cricket bat, many people like it. However, it isnt a very good bat. It is a cheap piece of kashmir willow. This is not a bat designed for an opening batsman who faces 75mph opening bowlers. It is designed for the tail ender who hardly ever gets a chance to bat. This bat still needs to be knocked in and will do much better against a tennis ball that it will against a cricket ball. please let me know if there is information on a product that you are looking for and i will see if i can get it for you. The gray nicolls atomic spike cricket shoes is a pretty good shoe. I found them to be comfortable, well padded and gives you good arch support. These shoes are available in rubber sole and spike versions. here is a short video i recorder to give you a close up view of the atomic gray nicolls cricket shoes. I was very impressed with the studs on these cricket shoes. You will certainly get some good grip on grass fields as well as fields that are perhaps wet. I would compare these shoes in quality with the Puma ballistic green rubber sole shoes. These shoes would definitely be better than attempting to play a game of cricket in a pair of running shoes which offer little to no grip. Thank you for reading my blog, i hope you found it helpful. Please feel free to contact me on 1.888.470.4746 or email me at jason@cricketstoreonline.com. You can also see a full range of my products at www.cricketstoreonline.com. 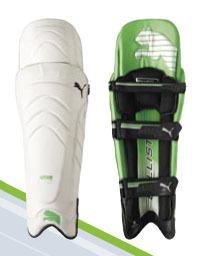 Puma Ballistic Flex Tec 6000 Batting Pads. So what can we say about these puma ballistic pads. They are easily some of the lightest cricket pads we have ever tested. The craftsmanship is just brilliant and very well put together. I would certainly recommend these Puma ballistic cricket batting pads to anyone who is serious about their cricket and wants to perform at the highest level. You will feel as if you don’t even have pads on they are so light. The puma ballistic’s are not the most comfortable pad available but they certainly are light. So save up a bit of cash, as they aren’t cheap, running anywhere from $150 – $180 USD. They are well worth the price though. The pads of choice for master-blasters Brendon McCullum and Adam Gilchrist, these leg guards are intended to offer wholesale freedom of movement in order to allow the more free-spirited batsman to tee off with minimal restriction. Notable features on these cut down pads include an internal Fibre Tech shield and a moulded kneecap. The lightest pads we’ve ever tested, these babies allow you to skip down the track with abandon. Suffered slightly in terms of comfort due to chaffing a previously acquired injury on one of our play-testers, and as eye-catching as they are you’ll probably have a few shots to avoid the odd remark from jealous opponents, but if you favour quick feet, don’t be shy on shelling out on these babies. Thanks a lot for reading my blog. Please head over to www.cricketstoreonline.com to see a full range of products. You can also email me at jason@cricketstoreonline.com.